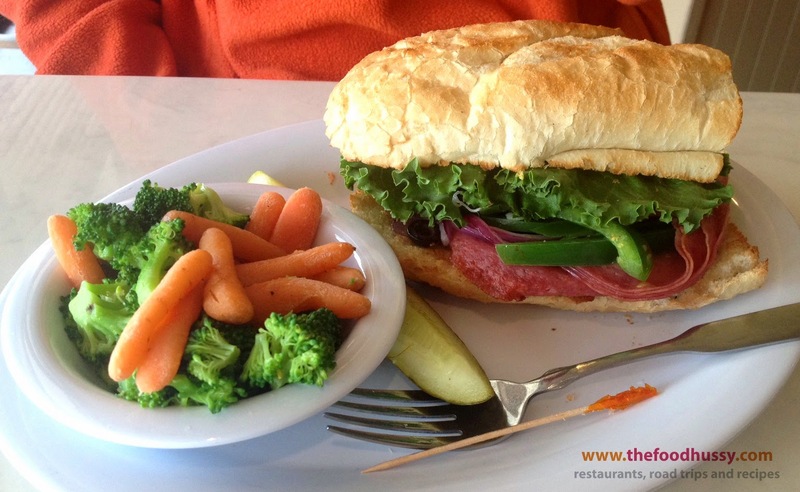 Restaurant Review + Giveaway: McAlister's Deli | The Food Hussy! The folks at McAlister's Deli sent me information about their Lenten options and I had to get out and try them! I'm not Catholic but I love fish - so I was all in! Larry got a rice krispie treat instead of a cookie and loved it - it was huge! The cookie was big as well - really thin and soft - I took mine home and it lasted me a couple of days! Perfect when I needed a little sweetness. Larry chose the Classic Italian which came with Black Forest ham, salami, provolone, lettuce, tomatoes, red onions, bell peppers and black olives topped with Italian Vinaigrette, salt, pepper and spicy brown mustard on a toasted baguette. For his side dish he chose the steamed veggies. The sandwich was delicious - I snagged a bite and am reminded that every time I try an Italian sandwich how much I love them! I love the salami & pepperoni combo! The veggies went untouched - they didn't really look too exciting. I knew exactly what I was going for - the Cajun Shrimp Po' Boy! Cajun-seasoned shrimp laid across a crunchy baguette with lettuce, tomato, coleslaw and remoulade sauce. I went with mac & cheese for a side. This was all delicious! The po' boy was stuffed and huge! It was so creamy and delicious! I would get this again in a heartbeat. The mac & cheese was good also - the noodles were a bit soft - but that's often the case in this type of situation. The flavor though was great. I loved this sandwich! Why Should You Go? McAlister's Deli has so many options - whether you want a salad, sandwich or even a loaded baked potato - there's something for you. I was impressed on this trip for sure - we both really enjoyed our sandwiches! Now it's your turn to go to McAlister's - enter to win lunch for 2 right now! What do you want to try? Disclosure: McAlister's Deli provided me two free lunch cards in exchange for this post. All opinions are my own.